Slowly stirring hot broth into creamy white rice soothes the soul―and the result comforts the body. 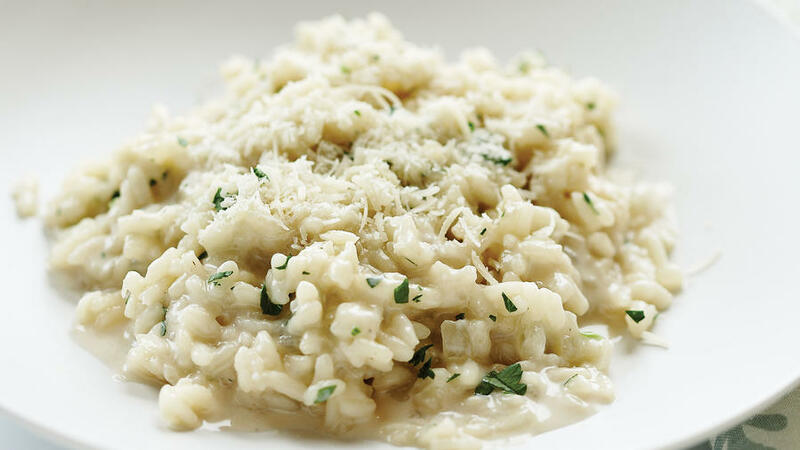 Risotto’s characteristic creaminess and chewiness come from the rice itself, and risotto rice is no ordinary rice. It contains two different starches: an amylopectin exterior, which softens faster―especially under the pressure of constant stirring―to create a creamy sensation in the mouth; and an amylose interior, which stays relatively firm during cooking to give you that al dente bite. Arborio is the starchiest of the three popular risotto types, and it’s the most prone to getting gummy as it cooks; inside, the grains tend to be chalky and crumbly. Widely available. Our favorite: Carnaroli has longer, narrow grains that cook the most evenly and have the best texture―creamy without being gluey, and a good chewy interior. Find at Whole Foods Markets, A.G. Ferrari Foods (agferrari.com), and gourmet grocery stores. Vialone Nano grains are smaller, oval-shaped, and produce a delicate risotto with a nutty flavor. Find at A.G. Ferrari Foods and specialty stores. Surprise: Sushi Rice Medium-grain Nishiki brand is creamy and chewy, and so much like Arborio that half our tasting panel couldn’t tell the difference. Plus, it costs less than any Italian risotto rice. Italian arancini―balls of rice (often stuffed with meat, vegetables, and/or cheese) coated with bread crumbs and fried―are a perfect party or snack food. Our staff devoured these creamy, crisp balls as soon as they were made.